ACT! is a solution close to our hearts for obvious reasons here at Sage. It’s been a mainstay and market leader for 25 years so it’s obviously doing something right – 2.8 million users, including many Sage One customers, can’t be wrong! 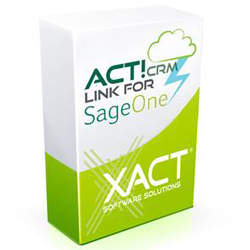 So, when Xact Software approached us about developing an integration between Sage One and ACT! we jumped at the chance. For those that don’t know, ACT! fills the space between sticky notes and a full, complex CRM in the same way that Sage One fills the space between a spreadsheet and a full, complex accounting package. The crossover between the two services is obvious. What was of great interest to me was the dynamics between a desktop service such as ACT! and a cloud-based service like Sage One Accounts. The answer in one word – seamless. A seamless transition that simply works as you would expect and in real time. Just one view, Sage One and ACT! To read more on the integration, including pricing details, visit Xact’s Link for ACT! to Sage One site and watch the demo video below. If you’re starting or growing a small business, take a look at our Sage One Cashbook, Accounts and Payroll software and sign up for a FREE 30 day trial by clicking on the buttons below.